When Garo Rupchian started his business, it was all about the craft. He began manufacturing jewelry for larger retailers as the European Jewelry Company in 1969. Back then, 607 Hill St., where Garo opened his workshop, was the first fully converted jewelry building of the Los Angeles Jewelry District, which now runs about 2 blocks long. European Jewelry Company established itself as an artisan manufacturer, but as the Jewelry District grew, so did the business. It eventually evolved into a trusted retailer specializing in custom designs Garo created. By the mid-80s, what was once a workshop had transformed into a showroom within the same building with a knowledgeable staff and loyal customers. Being a family-run business, it wasn’t unusual to find the Rupchian children in the store learning the details of the products or roaming the jewelry district observing the hustle and bustle of their neighbors. It wasn’t until son, Vic came on board in the 90s after graduating college, that the family business was taken to a new level. Having learned the craft of jewelry design and bringing an expertise in marketing and gemology, Vic had a vision for European Jewelry Co to become something bigger without ever losing its roots in the Jewelry District it had called home for decades. The store gained popularity when greater efforts were put into marketing and advertising. Taking a risk, Vic took out the store’s first 1/3 page ad in a free LA bridal magazine. The results were immediate and over the next 2 to 3 years, European Jewelry Co had full-page ads across multiple publications. It was around that time, other members of the family joined the business. 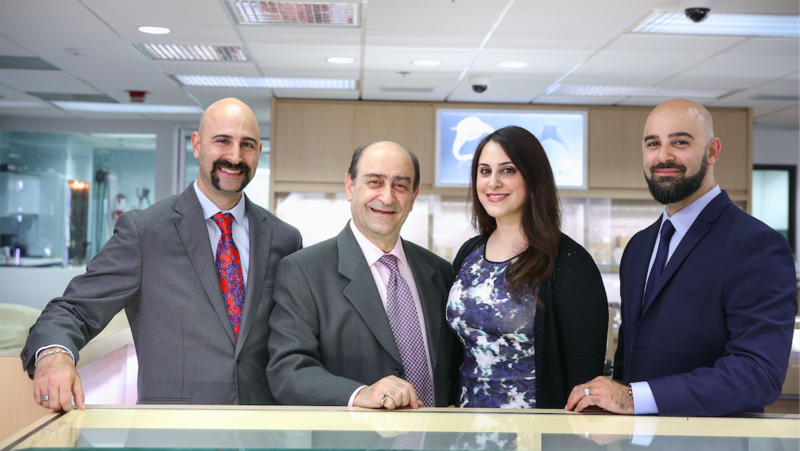 After completing their degrees, both Raffi and Ani Rupchian became integral parts of the store’s sales staff and in 2005 the family decided together to make the change that would forever establish their legacy in the Jewelry District. European Jewelry Co was officially rebranded in 2005 with a new showroom and a new name, Icing On The Ring. With this change, the Rupchian family had reinvented themselves and switched their emphasis to bridal and anniversary jewelry. Their fresh new look and exclusive collections of jewelry were like nothing else in the neighborhood. In 2011, Icing On The Ring moved one more time. Still in the 607 Hill St. location, but to a much larger showroom that could accommodate the product line and superior customer experience they had become known for. Today, the family and the store remain a strong presence in the LA Jewelry District and aim to provide customers an ideal ambiance for finding their perfect rings.